Mr. Sebehela Selepe was appointed the Chief Internal Auditor of the National University of Lesotho in 2006. He served the University as Special Assistant to the Vice-Chancellor for Finance and Administration (SAVC-FA) between April 2011 and September 2013. 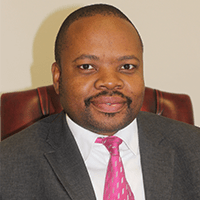 As the SAVC-FA he was reporting to the Vice Chancellor and overseeing Finance (Bursary), Human Resources Department (HRD) and Works and Maintenance Department (WMD) until he reverted to internal audit when the SAVC-FA was ceased by the University Council. Prior to serving the NUL, Mr. Selepe started his career in auditing in 1996 at the office of the Auditor General of Lesotho until 1999. In 1999 he joined Lesotho Brewing Company, trading as Maluti Mountain Brewery (MMB) where he held several positions which included being a Cost Accountant, Information Systems Manager and Head of Internal Audit. He left MMB in 2006 to join NUL. His other experience includes tutoring Auditing at the Centre for Accounting Studies and being a part-time lecturer of Financial, Cost and Management Accounting at the Institute of Extra Mural Studies (IEMS) of the National University of Lesotho. He also gathered experience in the field of auditing, finance and general management as a freelance consultant and partner of Business Finance Specialist Chartered Accountants. Mr. Selepe qualified as a Chartered Accountant at the Centre for Accounting Studies in 2003. He is a Council Member, a Chairperson of the Technical & Standards Committee and a practising member of the Lesotho Institute of Accountants (LIA). He is a member of Institute of Internal Auditor (IIA) Lesotho and South Africa. He is a founder member of the Lesotho chapter of the Institute of Internal Auditors. He serves on several boards, which included being appointed by the Hon. Minister of Finance to serve as a member of the first Audit Committee of the Government of Lesotho. His Continuous Profession Development (CPD) and interest is focused on the areas of governance, risk management, finance, taxation and auditing. Internal Audit authority and mandate is derived from National University of Lesotho Council. Its functions, activities and operations are defined in an Audit and Risk Charter. The University Council established an Internal Audit function as an independent appraisal function to examine and evaluate University activities and operations as a service to management and University Council. The Chief Internal Auditor who is the Chief Audit Executive (CAE) and head of the department reports functionally to the Audit and Risk Committee of Council and administratively to the Vice-Chancellor. As an advisor to management, Internal Audit acts as the right hand of the Council through the Audit and Risk Committee by giving assurance on the organisation‚s ability to meet its objectives, its governance, risks and controls. It is independent of any management functions or Officers and has access through the Audit and Risk Committee and to the Chairperson of the University Council if required. Acquire audit software to support review of systems and processes. Internal Audit Department is currently manned by one person who is also the CAE. The plan is to develop the department to a fully functional Internal Audit department that includes auditors whose will be on the auditing of the academic efficiency as this a very critical success factor for the existence of the National University of Lesotho.